Early cinema is making a bid for world recognition with the announcement that the film Harishchandrachi Factory has just been nominated as India’s official entry to the 2010 Academy Awards. The film, written, produced and directed by Paresh Mokashi, tells the story of Dhundiraj Govind Phalke, producer of India’s first full-length feature film in 1913, Raja Harishchandra. Harishchandrachi Factory has a lively website, where you can see clips, stills and learn about the production and D.G. Phalke himself. It tells the romanticised story of how Phalke took the medium that was the plaything of Europeans, Americans and elitist Indians, and gave it to the people, creating the Indian film industry in the process. Phalke was the one-man pioneer of Indian dramatic cinema – director, productor, cameraman, editor, actor, and all points in between. He was born in 1870, the son of a Sanskrit scholar, and after studying art and architecture became a photographer, make-up artist and even had a magic act, before established a printing works in in 1908. It was apparently the experience of seeing a filmed life of Christ in Bombay around 1911 that inspired him to establish a native Indian cinema. He travelled to Britain in 1912, puchasing a Williamson camera and gaining instruction in film techniques from Cecil Hepworth. He formed the Phalke Films Company that same year, and made his first film Raja Harishchandra, in 1913 (Phalke encouraged the belief that his was India’s first dramatic film, but it was preceded by two short dramatic films). The film told the story from Hindu mythology of King Harishchandra, as told in the Ramayana and the Mahabharata. The story tells how the virtuous king sacrifices his kingdom and his family in the pursuit of truth, only to be restored to power through the intervention of the grateful gods. 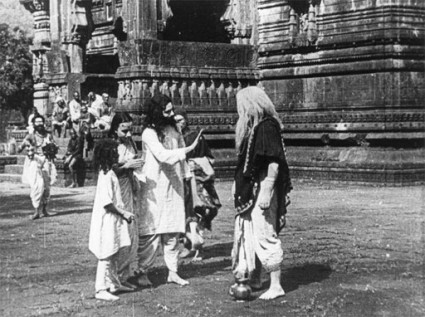 The film was originally 3,700ft long, and around half survives of what is said to be the film at the National Film Archive of India, though some sources state that what survives comes from Phalke’s 1917 remake Satyavadi Raja Harishchandra. The Archive lists eight Phalke films in its collection: Raja Harishchandra, Lanka Dahan (1917), Shree Krishna Janma (1918), Kaliya Mardan (1919), Sinhasta Mela (1921), Tukaram (1921), Brick Laying (1922), Setu Bandhan (1932) and the undated Pithache Panje. 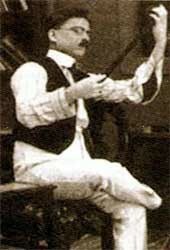 Scenes of Phalke at work also exist from a 1917 short Chitrapat Kase Tayar Kartat (How Films are Made). Phalke Films made four more films, then in 1914 Phalke returned to London to established business contacts and obtain fresh production equipment, later setting up Hindustan Cinema Films and going on to make over forty silent features and one talkie. He died in 1944. Harishchandrachi Factory is bound to generate renewed interest in the revered founding father of Indian cinema, whose own history is now almost as much bound up in mythology as the subjects of his pioneering films.